This two faucet kit starts you off prepared for any situation you may find yourself in! Use a "standard" CO2 Cylinder like the larger capacity 5#, 10#, or even 20# with the base configuration! 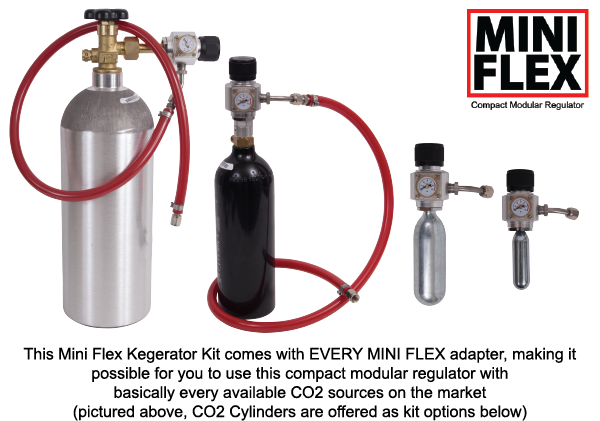 Easily swap out adapters for when you may want to use the smaller capacity 20oz, 74gram, and 16gram CO2 sources for mobile kegging needs or if that's all you have at your home currently. The ultimate basic keg kit for an amazing price. View the video below to see just how flexible this kit is!